If you visit our Afan Woodland centre you will see a large tree at the entrance. I think that it is about a hundred years old. 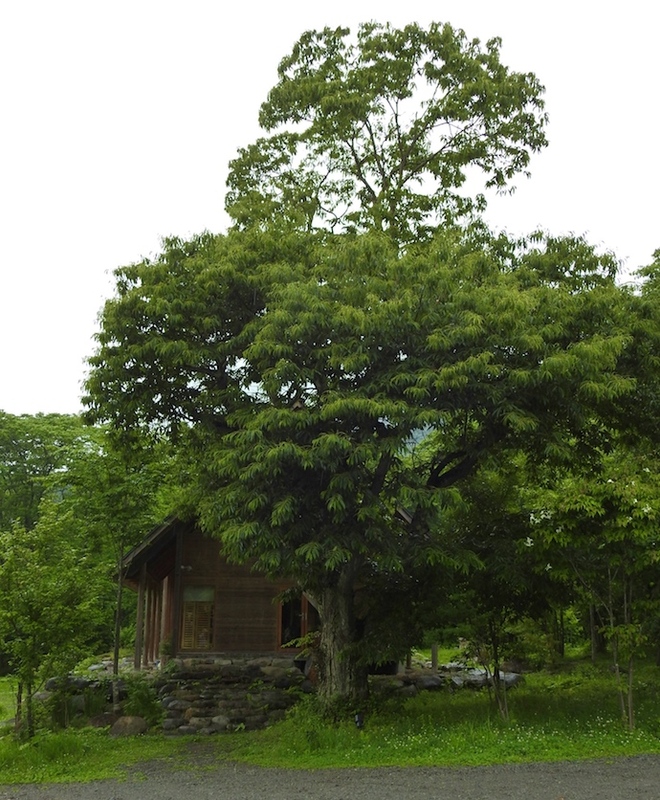 We had to trim the branches when we built the centre, but this was good for the tree, as it grew lots of young and vigorous branches and each year it gives us a crop of quite large chestnuts that I use in all kinds of cooking. The chestnuts are twice as big as the wild native chestnuts found in our woods. 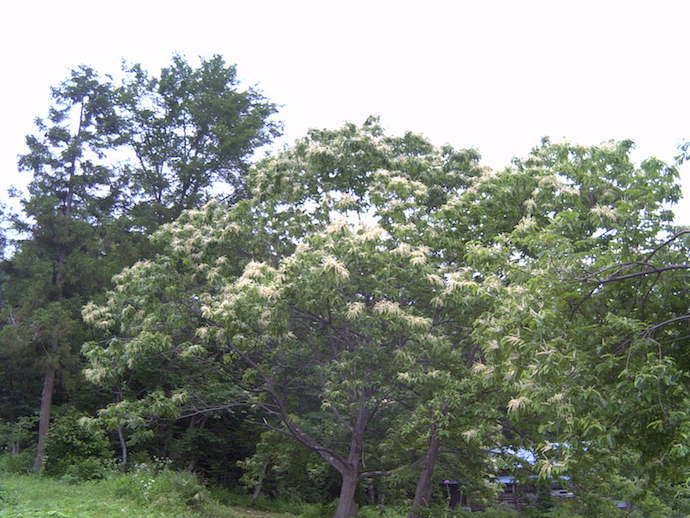 These are the small, sweet Japanese chestnuts, Castanea crenata, which grown on a smallish tree, 10 to 15 metres tall. In 1900, the North American chestnut, a very common tree, whose wood was used for all kinds of things from furniture to fencing, was almost wiped out by a fungal disease. 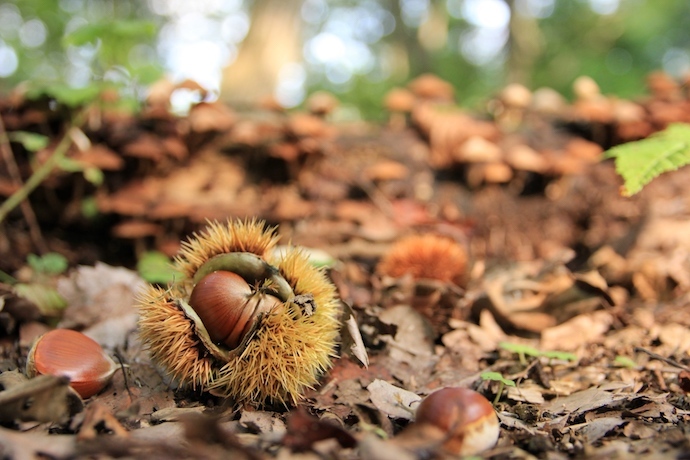 Consequently Japanese chestnuts, which are resistant to this disease, were brought in to make hybrids, and a great effort is being made to bring back hybrid chestnut trees to the American forests. The Romans introduced chestnut trees to Britain from southern Europe some two thousand years ago, and it became a very common tree, important to the British for food and timber. Throughout Europe, chestnut trees(Castanea sativa) which can grow to be as high as 35 metres, and live for as long as 700 years, were commonly pollarded, their tops cut at a height of two and a half metres. The pollarded chestnuts grow vigorously, and the new young branches were (and still are) used for poles. Pollarded chestnuts give off lots of sweet chestnuts too. They were cut at this height so as to keep the young branches out of reach from deer or free ranging cattle and horses. Chestnut trees have both male and female flowers on the same tree, growing in catkins 7-20 cms. Long. They are pollinated by insects, especially bees, and the female flowers produce spiky cupules with three or more nuts. In Japan chestnuts are a favorite food for bears, squirrels, and wild boar. Chestnut wood, reddish brown in colour, is strong, smooth, easy to handle, and very popular in the west for furniture and flooring. I myself planted a few hybrid chestnuts on the land which we are not using for our new ‘horse lodge’ and these trees, in good seasons, give me a couple of buckets full of nuts which I use for stuffing Christmas turkeys and for making a rich, delicious, chicken and chestnut soup. Of course, I have to harvest the fallen chestnuts before the wild boar get to them. Wild boar, fattened on chestnuts during a peak chestnut year, are absolutely delicious, with fat that melts in your mouth.